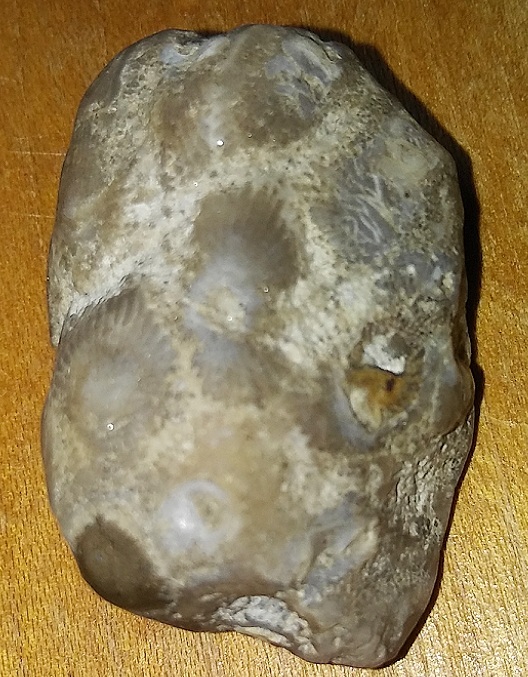 I recently found a Petoskey Stone among others on the same tiny (12 foot) beach in Mid/Upper Michigan, as I have for years in the same location. Only...this one's different. I can't seem to polish it down entirely by hand OR with a dremel. It has a lot of beveled structure still compared to others I've seen, and it just feels HARD. There also seem to be tiny crystal bits in some places. Can Pestoskey Stones (limestone as I understand it) harden into Travertine or Marble and retain their distinct pattern and shape? It's unlikely to have been metamorphosed into marble, as that requires great heat and pressure and is not consistent with the geology in that area. Travertine is a calcium deposit associated with hot springs, again not consistent with the local geology. It is more likely that the coral has been partially replaced with silica, which is much harder than calcium carbonate (limestone). One way to test this would be to see if the fossil fizzes when you put some vinegar (5% acetic acid) on it. Limestone will fizz (and be etched) and silica will not. Bear in mind that it is not too uncommon to have the actual fossil replaced by silica while the matrix it is in remains limestone, so you might have to look carefully to see if the fossil is fizzing as opposed to the rock it is in. Silicified fossils can be released from their matrix by dissolving the limestone in acid, which can (if done slowly and carefully) yield exquisite specimens free of the rock. However sometimes the silicification only involves part of the fossil, in which case the unsilicified parts will be destroyed. The piece is not fizzing at all. Does that mean it's been totally replaced? Attached is the specimen, which polished up some but isn't cooperating with further grinding work. I think it looks cool with all the preserved structure but I'm just fascinated with its different characteristics compared to other petoskey I've worked with. It's very brown compared to other petoskey removed from the same beach (i realize they come all shades but this beach produces all cool gray stones that are very "soft" in composition) and very "milky" in places. No fizz = no calcite. It is most likely a quartzite replacement (which is a harder stone than calcite). You can still polish it -- but it will take longer. Should take a good polish though. I guess I'll up my game and hit it with some 50grit. Which i could have done in the first place i suppose but i wanted to know WHY this piece was different. I'm excited by what I've learned here and elsewhere today. 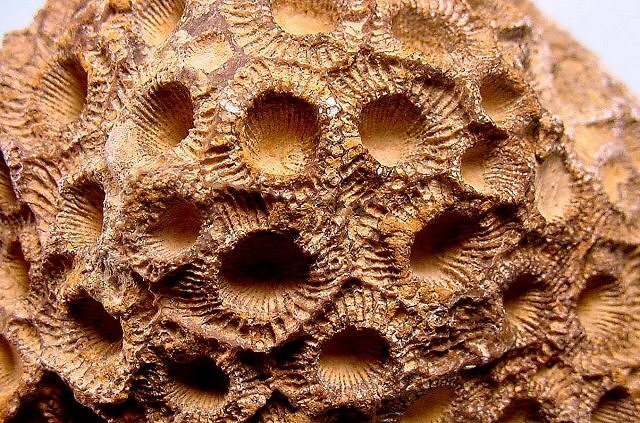 Petoskey stones are generally the Devonian coral Hexagonaria sp.